We added a cool new feature that allows you to customize your own fields and track them during an employees shift. What does this mean?? 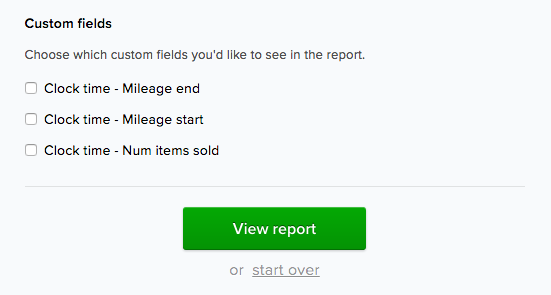 With custom fields, you can track things like piecework, and mileage. You can ask questions like: What did you do today? How many clients did you call? Number of completed tasks? What sites did you visit? Projects completed? What you want to track is endless, so get creative! We also made some interface changes. You can now search, sort, and toggle the fields you want to see throughout your Clockspot account. All our features are based entirely on your feedback so let us know what you think. We’re working hard on the other requested features so thank you for being patient with us! Custom fields allows you to add your own arbitrary fields to data like clock times, users, time entries, etc. This allows you to highly customize Clockspot to your specific business needs. For example, if you want to track the number of items sold by each employee during their shift, you can add a custom field named ‘Num items sold’ to clock times. Then when employees clock in, they can enter the number of items they sold in this field. To add a custom field, go to Company > Custom fields, then click Add custom field in the top right corner. To fill out a custom field when clocking in, go to Time clock, then click Work report. Once you’ve added your custom fields, you can have them show up in your reports. Simply go to Reports > Timesheet report, then select the custom fields you want to include.